Like most people, I was already aware that the infrastructure of the United States was rapidly decaying. However, seeing some hard numbers actually quantifying the severity of this problem was nothing less than shocking. In fact, while the U.S. government was pretending to be attending to its neglected infrastructure, the U.S.’s global ranking for the quality of its infrastructure was plummeting lower. A Reuters article reveals that in a mere four years (from 2007 to 2011) the U.S.’s ranking fell from #6 to #16. Keep in mind that building infrastructure is a slow, long-term commitment. Thus being able to fall ten places in this ranking in a mere four years is a mind-numbing demonstration of negligence and mismanagement. To suffer a plunge of this magnitude while claiming to be focusing on infrastructure investment is an indictment of the saturation-level of deceit of this government. 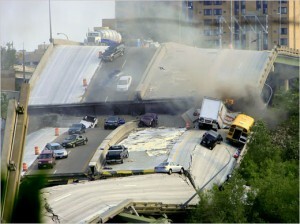 Obviously it’s only a matter of time until more U.S. bridges start falling down. U.S. government negligence in this area appears even more appalling when compared to other parts of the world. While the U.S. propaganda-machine continues pummeling Europe with its fear-hype over the “Euro debt crisis”, Europe is currently investing a robust 5% of its GDP in infrastructure – more than double the paltry 2% spent by the U.S. And this is not a new trend. Infrastructure investment in the U.S. hasn’t risen above 2% of GDP for more than 30 years. The European statistic can be viewed in two ways. For those with a bullish outlook, Europe is literally “paving the way” for future economic growth with this high level of infrastructure investment. For the bearish, this high level of investment represents an area where large budget cuts can be achieved without immediately impacting the level of public services. Thus (at least in this one respect), European “austerity” is not an exercise in inevitable economic suicide. Conversely, the U.S. position can only be summed-up as “totally screwed”. The $trillions in new debt and money-printing which was supposed to “fix” the U.S. economy has all been wasted (most of it stuffed into the vaults of Wall Street banks). Now, like all deadbeats who have exhausted their credit, “austerity” is coming to the U.S. – whether it likes it or not. With an economy starved for legitimate investment, “prescribing” austerity for this economy is like a doctor telling a patient with severe anemia to go on an extreme “diet”: it is a terminal sentence. Across an ocean, China is investing a stunning 9% of its own GDP into infrastructure investment. The U.S. media relentlessly publishes one piece of fiction after another about all the supposed “bubbles” cropping-up in China’s economy due to “over-building”. The reality however is that with China’s overall economy growing at near double-digits, with its domestic economy growing at nearly a 20% rate, with rapidly rising incomes, and a massive manufacturing “engine”, this is an economy which can easily “grow into” all of this new construction. In contrast, the U.S. is an “old” economy, with no growth, massive debts, and it is literally falling apart. To make a terrible situation worse, its hopelessly dysfunctional government has demonstrated itself to be nothing but a cacaphony of squabbling children. When Rome was burning, it is said that the Emperor Nero merely “fiddled” – oblivious to the flames around him. However, as the United States “burns”, Republicans and Democrats both watch with glee – with their only objective being to try to blame the other side for this economic suicide. In turn, this is the obvious consequence of having a completely “broken” political system, with most electoral districts so severely gerrymandered that roughly ¾ of all these districts no longer have “elections” (in any meaningful sense). Instead, in most of these ridings the U.S.’s political aristocrats are simply appointed for life. When your own “seat” at the trough is guaranteed for life, you can abandon trivial considerations like “good government”, and focus completely on what is “really important”: making the other side look bad. Instead of the U.S. government being composed of 500+ “public servants”, all working to provide the best government possible, Americans have elected a somewhat different group: 500+ assassins – all scheming to “murder” the U.S. economy (and then “plant the evidence” on their opponent). This specific catastrophe highlights a broader theme which constantly appears in my own writing. The U.S. (like all other Western economies) is suffering through the worst revenue crisis in its history. To remind readers (yet one more time) this was the inevitable consequence of our governments collectively squeezing-dry the bottom-85% of their populations – while refusing to tax the top-15%. Those on the bottom have nothing left to squeeze out of them. Meanwhile, those on top are hoarding $10’s of trillions – larger hoards of wealth than what were accumulated by the Kings and Queens of the Middle Ages. Not only are those hidden, hoarded $trillions the literal “life-blood” of our economies; without beginning to tax-back those massive hoards of wealth it is mathematically impossible for any Western nation to return to solvency. In the particular case of the United States, we see a totally broken economy – which immediately requires massive expenditures in infrastructure, education, and other areas of social/economic investment. At the same time, it is just beginning to see the baby-boomers holding out their hands – looking to collect more in “entitlements” than any other generation in history. Anyone with an intellect greater than that of your average “Tea Party” Republican knows you cannot address these massive, structural revenue deficits with “austerity”. Indeed, proving that they “just don’t get it”, Reuters reports that a phalanx of these economic Neanderthals are looking to reduce U.S. “transportation funding” – the primary source for infrastructure dollars. At the state and local level, U.S. governments have already started laying-off vast numbers of teachers, police officers, and firefighters – just so they can continue to make interest payments to bond-parasites. No debt is ever paid-off in this perpetual economic slavery. Meanwhile, at the national level, U.S. political “leaders” stand by and watch the country fall apart, because the ultra-wealthy aristocrats who bought them have decreed that it is better for the entire nation to (literally) fall apart than for them to pay their “fair share” in taxes. Yeah, this is going to be ugly. I will make one augmentation to your essay. I fact, there WAS quite a bit of genuine domestic infrastructure spending as part of the “stimulus” package. However, it would be better characterized as “infrastructure catching-up”, not “infrastructure investment”. As best I can tell (from on-the-ground observation), it was simply a way for localities to make up for the insufficient infrastructure maintenance of the last 5… 10.. 20 years or more. And it didn’t seem to be enough, to boot. I still see overwhelming deteriorating quality of roads and rail all throughout the US, with the targetted exceptions due to the stimulus spending proving far insufficient to keep up with general infrastructure needs. The estimates I’ve heard for us to just catch up that amount to the trillions sound correct to me. Frankly I don’t think the Feds can manage this (obviously, they’ve mismanaged it to date). If the majority of federal income taxes were abolished and instead collected at the local level (or some amount somewhat less thereof), we might have a hope in hell of reversing this. But we have less a hope in hell of this regime actually assenting to that. Though, perhaps that outcome will arise anyways, by happenstance. Admin, I would imagine that some of this supposed infrastrucure spending was “shared cost” initiatives between the federal and state governments – like that bridge from Michigan that’s not getting built. Also since the data I have on spending shows NO increased spending during the supposed stimulus years, and the ranking data shows the U.S. steadily plummeting lower, this would seem to pretty clearly refute the CLAIMS by the Obama regime. Of course something which DOES make U.S. infrastructure spending LOOK smaller than it is is the way the U.S. government exaggerates GDP. If it didn’t exaggerate GDP by such a great degree then U.S. infrastructure spending could be more like 3%.